The Microsoft .NET Framework is required to be installed by more and more application software in order for the programs to run in Windows operating system. .NET Framework provides large library of coded solutions to common programming problems, thus its runtime is required for proper execution of the apps. However, sometimes, .NET Framework installation and uninstallation may not be totally error-free, where a .NET Framework Setup Verification Utility can be used to check the properly installation of .NET Framework. Normally, uninstall and then re-install or repair the .NET Framework should succeed to fix and resolve many issues, but for some reasons, some systems may continue to experience error or failure when installing or trying to remove or clean the trace of .NET Framework, there is a cleanup tool available, aptly called .NET Framework Cleanup Tool. .NET Framework Cleanup Tool automatically performs a set of steps to remove selected versions of the .NET Framework from a computer. It will remove files, directories, registry keys and values and Windows Installer product registration information for the .NET Framework, so that the system is return to the relatively clean state. However, as the .NET Framework 2.0 SP2, 3.0 SP2 and 3.5 SP1 are all installed as OS components on Windows 7, so the cleanup tool will not remove these versions of the .NET Framework on Windows 7. And the cleanup tool will delete shared files and registry keys used by other versions of the .NET Framework, thus any .NET Framework versions that are still installed on the system must be manually repaired or re-installed. 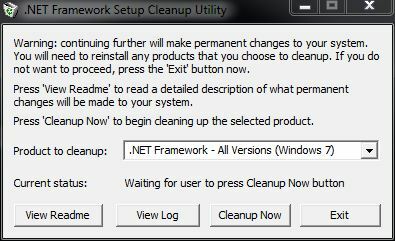 .NET Framework Cleanup Tool is written by Aaron Stebner, and is available for free download: dotnetfx_cleanup_tool.zip (alternative link).